I have now started up planning and execution of my MAN 8.136 expedition project, and I would like to share my ideas and findings with you. First off all, sorry for the language. I speak and read the German language pretty fair, but the written has always been a challenge for me. That is why I prefer to do the writing in English. Before starting up the project, I have spent a lot of time reading all the interesting posts in this forum. It is incredible how mush knowledge there are shared between enthusiasts. A small introduction of myself. We live in the southern part of Denmark, about one hour from Germany. We have been driving Land Rover for the last 25 years as our daily driver and for off road fun, but also for more serious offroad racing. Along the years the racing is reduced to participation in the local Land Rover trial cup, and the wish for traveling has been rising. We have over the years been traveling a lot in the Icelandic highland, in Norway and in Sweden using roof tent, but now we want something with more comfort. That’s why we now have been starting this project. The first decision to take was the choice of type, size and brand. 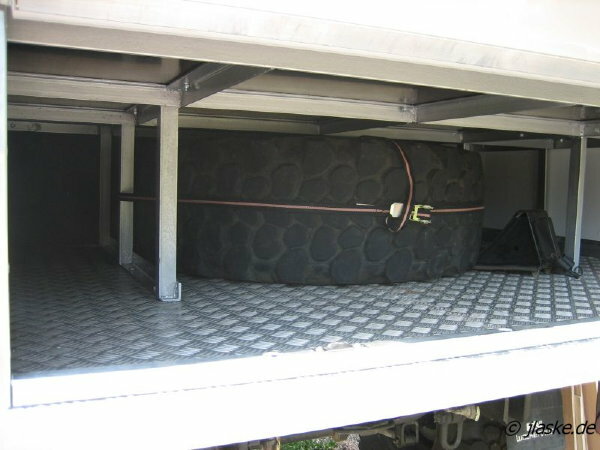 The type is chosen to be as an ordinary truck (LKW) because of the Danish tax regulations, this also means that the camper-box has to be transported as a load and it must be able unload the camper-box from the truck. A connection between the camper-box and the drivers cab, is also not possible. The size is decided to be at max 7450 kg, because of the EU regulations of "Driving and rest time". For a private registered truck these roles it is only valid for trucks from 7500 kg and above. The brand is chosen to be a MAN, because of the availability of MAN 8.136 used by the Danish army and now being sold out. This truck fits all our wishes: 4x4, 3 front seats, simple diesel engine without any electronic, right size (weight and size). So now the truck has been bought and registered. It is a 1990 MAN 8.136 with 47000 km on the clock and decent Michelin tires. It is running great and is easy and quite fun to drive. I have decided to build as much as possible by myself, and at the beginning this did also cover the camper-box. But finally we decided to buy an empty box. This is more expensive, but we think it will be a better long term solution. So now the hunt started for the right box to the right price. I send out request for offer to a number of manufacturer being mentioned in this forum and some found by myself, and got answer back from some of them. We finally decided on a Danish manufacturer (http://www.fibercon.dk/) that was able to deliver an empty fiberglass box for a reasonable price, mounted with a door from Outbound in the Netherland. I will pick up the box at the end of this month, and the plan is to update this post with photo and information along the actual building process during the next couple of month. The box is manufactured with 50 mm fiberglass sandwich for walls and roof, and 40 mm fiberglass sandwich with 12 mm inside plywood as floor. The box size is 4000x2350x2150 mm (LxWxH) and the empty weight will be app 450 kg. The box will be mounted on the original truck bed, using two large brackets. One in front of the bed, and one at the end of the bed. Heating will be done as floor heating (water) like in a house, using a Webasto Diesel water heater. Main power will be 24V from 2x240 Ah batteries, charged by 600Wp solar cells. 230V will also be available from a 2000W inverter, mostly for the refrigerator. I hope you like the project, and I will keep you updated when we are doing progress. As you said, easy and fun to drive, we have our now for 10years and travelled 70000km with it. No major problems so far. For a 4m Box where do you mount your spare wheel ? Because of the short wheelbase box sizes are limited, we have solved this with an alkoven at the rear end. So base floor length of our box is 3.6m and roof length 4.2m. So we could mount spare wheels behind the box with reasonable langth behind the rear axle. I will carry thy spare wheel on the roof rack, and build a small crane between the drivers cab and the box. The crane will be able rice, lower and swing the boom (manually), and lift using an electrical winch mounted below the bed like the original one for the spare wheel. When not in use, the crane will be lowered to roof height of the drivers cab. I have doubts if it is a good idea to mount the spare wheel on the roof rack. 1. I don´t think, that the roof rack is made to carry a load exceeding 100kg. I would set the limit to 60 - 70 kg max (Only estimation. But that will limit the load on every foot of the roof rack to app. 15-20kg, the weight of a full 20l jerry can). 2. Such a heavy load mounted so high up woudn´t improve the behaviour of the vehicle in curves and off road. What would you think of mounting a wheel rack on the front bumper? Enhaces the length of the vehicle a bit, but that seems to be the minor problem to me. Nevertheless you should shift the construction of the crane a bit till some more ideas had been suggested. Btw, I did it the same way as you did: I bought the car and an empty cabin, only equipped with a door. And then I did as much as I could by myself. But my cabin is only 3,50m long, so I could mount the spare wheel on the end of the cabin. I have raised the back seating group by 42 cm and have the full space below as storage for spare wheel, tools, camping gear and other stuff. Above the seats I have still more than 100 cm to sit upright. But no overhead compartments. The center of gravity is as low as possible. Zuletzt geändert von Lassie am 2017-01-17 17:58:10, insgesamt 1-mal geändert. Thank you for your comments and input. Some more details for our building project. This is how I expect to install water and heating. The water will be with constant pressure using a pump and expansion tank for the purpose. This will give the possibility to use standard (and cheaper) pluming equipment. Cold water will be supplied to all taps, directly, and warm water will be supplied using a standard and cheap (160 Eur) heat exchanger, large enough to give constant hot water. Heating can be given in two ways, off grid or connected to 230V. When off grid, the heating is given from a Webasto Thermo Top E (4Kw) diesel heater. I have been in dialog with the distributor for Webasto and Eberspächer, asking for diesel burners able to be used continuously, and the recommendation was that Thermo Top is the only series that can be guaranteed for that purpose. The Webasto will be installed with the possibility to run the water pump, without running the burner itself. Hot water from the pump, will continue to the El-water heater and use the 30Ltr as a heating buffer before entering the heat exchanger for hot water. After here the thermostats will control the heating and returning cold water to the Webasto. When connected to 230V "land power", the electrical water heater can in most situations supply the needed heating. The circulation will be the same, but the Webasto water pump will be running without the burner is running. When doing the pluming like this, using standard components, the only expensive part will be the Webasto. Water and heating layout and components. Pretty comfortable. I have to admit, that this is much too comfortable for me. . Can´t make any comments / suggestions with that. But good luck with your project. The water will be with constant pressure using a pump and expansion tank for the purpose. I have read a lot about other travellers esp offroad and long term travellers. One of the points which struck me most, is that the majority of technical problems while traveling comes from the 'comfortable' water supply. Leaks, failing pumps or valves, broken sealings, broken pipes due to vibration, contamination with algaes or other 'warm-water-flora', etc. This made me think twice and I came to the conclusion, that water from jerry cans and a pressureless watersupply might be less comfortable, but much more durable and also cheaper in production, maintenance and repair. If I want hotel like standards in my living quarters, I take a nice hotel. But everybody is different - which is good! Now the new box is starting to take shape. The panels are being assembled and the Outbound door are ready for mounting. Soon we are ready to mount the new box to the car. like this. The advantage is, to get a comfortable temprature within minutes and with air tubes behind or under the furniture you willget less problems with condensation and moisture. I think with your floor heating, which is really comfortable as well, it takes minimum 5-10 times longer to bring the cabin up to 20 degrees in winter. You can install the blower like a radiator and aktivate it with a thermostat or switch. Post more pictures we all like to see your progress. It seems you are in a more or less similar projectphase like me. I hope to mount the box in the summertime. You are planing a 200 Liter Watertank, so I guess you have to take care for your waterquality. Do you want to disinfect your tank ervery time or are you planing to install a waterfilter?? If you want to have a accetable volumeflow to have shower with filtered water. You have some options. a) Use more the one filters parallel. b) Use a pressure tank behind the filter. But then you have just the volume of the filter with a high flow. c) take a high pressure pumpe with a reducing valve behind the filter. Now the new box are ready, and we have to finalize bracket and other stuff needed to prepare the box to be mounted and demounted when needed. It has been a busy Saturday, and tomorrow new painting will be done the places that will be hidden by the box. Today was the day to find out if the box actually does fit to the MAN. I drove to the manufacturer (FiberCon) to review the box and get it mounted using the new brackets and fixings. The box was real nice and exactly as we had agreed. All brackets and fixings worked as expected and we could mount the 8 large stainless bolts needed to mount the box. Everything fitted as expected and I was a very happy man. I think the size is just right for the MAN. Bach home with the box, I tested how fast a 1000W electric heater could rise the temperature from 2 deg centigrade to 19 deg centigrade. 30 minutes was needed. Now I am sure that the 4KW Webasto will doo the job. Jørn, Sales manager at FiberCon is handing the box over to me. It is a fun process to go from thoughts and drawings, to the physical world. With the box home at my own workshop, the truths about size and feeling of space can be tested. We have now marked up the floor with masking tape, to evaluate the layout. I don’t know if any other has tried to do the same before starting the actual build, but for us it definitely is showing much more than a drawing. The next thing that will happen, is laydown of floor heating tubes and the new floor. Any comment or input to our project are welcome. This weekend it was time for making the box able to "stand on its own feet's"
The box can now easily be de-mounted and mounted, and the MAN can be used as an ordinary truck when not carrying the box. Each of the jacks can lift 1500 kg, so next step is to find a way of securing more stability for the stand alone box. Now it was time to spend another day at the box building project for the MAN. It was time to start up the working inside, and the first to do is preparation for electrical and heating installation. I started preparing the electrical installations, by fitting empty flexible pipes that later on can be used to guide the needed electrical wires. The flex pipes is mounted all the way round the edges, with more pipes where I expect to need more wires. The tubes for cold, warm and waste water was also mounted. When I did the drawing for the box, I already planned for floor heating. The floor heating is done by using a 24 mm system prepared for 16 mm heating tube. The system secure equal heat distribution by pre formed aluminum profiles in the Styrofoam. It was a little fiddly to ensure that the floor heating ended up only for the visible floor, and not below kitchen, fridge or water tanks. But when the heating tube is fixed in the aluminum profiles, it is actually ok.
On top of the 24 mm Styrofoam, I mount 12 mm plywood. The plywood is simply mounted into the original floor of the box, ensuring not being too close to any of the heating tubes. I used a marker to illustrate the position of all tubes below the plywood floor. Before I can continue with the floor, I now have to mount the heating system. When the heating system is mounted and functional, the floor can be heated and the moisture can be removed. Then the final vinyl floor can be mounted. If you have any comments or ideas, please do not hesitate. The heating and floor are now finished. The Webasto Thermo Top is running smoothly and heat distribution in the floor is as expected. The floor heating is only mounted in "walk" areas. We have chosen to mount a radiator in circulation with the floor heating. The thermostat for the radiator is this way also controlling the floor heating. The outside temperature is at the moment between 0 and 5 °C and with an constant inside temperature in the box at 23 °C, the consumption is 1,5 liter of diesel per day. Way below what is needed in our Fendt caravan. It has been some time since the last update, but the building is slowly stating to take shape. - Most of the furniture is ready to be mounted permanently. - Battery bank and inverter is running, inclusive "land-power"
Water tanks for fresh and waste water 2 x 70L (one more for fresh water will be mounted later). 3 x 24V 80 Ah marine battery in the camperbox + 1 x 24V 110 Ah starting battery on the MAN. Das Bauprojekt der neuen Box für unsere MAN 8.16 ist nun knapp am Ziel. Wir haben die Box schon eine Woche im Sommerurlaub getestet, wo wir zum jährlichen Offroad-Treffen im Danish Land Rover Club Teilnehmer war. Ich habe mich dafür entschieden, diesen Beitrag auf Deutsch zu machen, weil ich gerne ein paar Kommentare zum Projekt hätte. Also habe ihr irgendwelche Kommentare oder Fragen, fühlen Sie sich frei zu fragen. Wir hatten offensichtlich ein völlig anderes Lastenheft (oder in dem Fall: Lasterheft?) als Ihr, und deshalb ist Euer Laster völlig anders (aber NICHT schlechter!) geworden als unserer. Wir haben sehr viel Wert auf ein grosses und komfortables Bett mit richtigen Lattenrosten gelegt. Und auf eine funktionierende Heizung und Dusche. Aller sonstige Komfort stand weit unten auf der Liste. Wie ich schon geschrieben habe: Ein bisschen zu viel Technik für mich. Aber ich mag Dein "dänisches Design", das habe ich leider nicht annähernd so gut hingekriegt. Und wo ist jetzt Dein Reserverad hingekommen? Das sieht man leider auf keinem Deiner Bilder. Ja, wir haben sehr unterschiedliche Regeln für den privaten Gebrauch von Lkw, obwohl beide Länder deutlich unter den EU-Vorschriften ist. Daher ist einige meiner Lösungen anders als bei ihnen. Wir haben auch Pläne für ein festes Bett mit echten Matratzen, aber so weit sind wir nur noch nicht angekommen. Der Plan ist, dass über die Sitzgruppe ein Hubbett zu montieren. Es muss auch auf halbem Wege gestoppt werden, so dass wir 4 im Auto schlafen können, wen nötig. Ich habe noch nicht die richtige Lösung zu mein Reserverad gefunden, aber die Punkte stehen nach wie vor in Richtung der es auf dem Dach zu haben. Übrigens haben wir über einer Testfahrt zu AMR Globetrotter-Treffen in Amelinghausen (25-27 August) gesprochen, das ist nicht so weit von Dänemark. Vielleicht können wir mehr Ideen und Inspiration dort erhalten. Hat jemand Erfahrung mit dieses treffen? Nachdem wir viel Energie und Zeit gebaut haben und die Kiste zu bauen, ist es jetzt Zeit, am Auto zu arbeiten. Deshalb wurde diese Wochenende verwendet, um es in einer etwas neutralen Farbe gemalt zu machen als das "armygreen". Jetzt ist das Auto im fein weiß in der gleichen Farbe wie die Box. Nach einer längeren Pause, ist es wieder Zeit für ein bisschen Arbeit am unsere MAN. Jetzt geht es um eine vernünftige Strohm / Info Panel zu herstellen, das mindestens Information über Batterien, Wasser und grau Wasser geben. Das Panel ist nun fertig und getestet. Next Ziel ist Niveau Sensoren in unsere 3 Wassertanken einzubauen. zuerst viele Grüße nach Dänemark, ich habe das Land bis jetzt zwei mal bereist, und mir gefällt es sehr. Besonders die sanft hügelige Landschaft ist Klasse, sowie chillen am Strand. Nun zum LKW, ich möchte mich nicht sehr einmischen, aber 140 Liter H2O ist viel zu wenig. Ich habe eine 3,6 m lange Kabine, aber 400 Liter Wasser. Natürlich kenne ich nicht deine Reiseländer Wunschliste, für Island bis Portugal reichen eventuell 140 Liter, aber auch nur wenn du von Campingplatz zu Campingplatz fährst. Dazu kommen noch reisen in ferne Länder. Somit bieten sich wesentlich mehr als 250 Liter H2O an, mit weniger Wasser kann ich auch Motorrad fahren. Dänen sind gepflegte Nordeuropäer. Es kommt auch darauf an wie lange will ich nichts mit Bunkern von Essen und Wasser zu tun haben. sieht alles echt fein aus! Bei solch einem Neuaufbau kann man schon sehr viel Zeit und Nerven einbringen, von daher recht zügig durchgezogen. Wassertechnisch finde ich das Konzept auch stimmig. In Europa wird man immer Wasser bekommen. Und für das tiefste Outback kann man immer noch Kanister dazu bunkern. Vor allem ist der Wagen auch nur max ein 8 Tonner. Und schwerer wird das ganze mit der Zeit automatisch. Normaler weise verbrauchen wir nicht vieles Wasser. Unsere Erfahrung nach, brauchen wir in Durchschnitt 10 Liter pro tag pro Person. Unsere 140 Liter sind für eine Woche für uns geeignet. Das geht prima so lange als wir innerhalb von Europa reisen. Als wir das Layout für das Projekt planten, war eines der Ziele, dass die Box abnehmbar sein sollte und dass sie ohne Stehen auf dem Auto verwendet werden kann. Daher sollte sich alles in der Box befinden, damit es auch bei starkem Frost eingesetzt werden kann. Wir hätten gerne Platz für mehr Wasser, aber dann wird es in einem zusätzlichen Tank außerhalb der Box sein, der nur bei warmes Wetter verwendet werden kann. wir sollten einfach mal anfangen, über unsere Komfortansprüche nachzudenken. Ich finde es nämlich gelinde gesagt unpassend, wenn wir Mitteleuropäer mit unseren Luxuswohnmobilen in Ländern wo Trinkwasser wirklich ein wertvolles Gut ist, vorfahren und 1000l bunkern, während Einheimische warten müssen bis sie ihre über weite Strecken rangekarrten kleinen Gefäße füllen dürfen. Wenn das Ziel ist, solche Situationen gerade zu vermeiden mit großen Tanks, dann lass ich mir das gefallen. Sparsamkeit und Reduzierung des Komforts sind aber mindestens genau so gute Mittel, dieser Problematik zu begegnen. Wir hatten in 3 Monaten Marokko mit 2 Personen 200l Frischwasser im Wassersack und 30l im Kanister für die Küche dabei. Den 30l Kanister der Küche haben wir bei jeder Gelegenheit wieder aufgefüllt. Den Inhalt des 200l Wassersacks haben wir nicht ganz leer bekommen zum duschen - und nein, wir haben nicht gestunken! Man kann sich mit sehr wenig Wasser und einem Waschlappen sauber halten. Für mich klingt das nicht sachlich! An Ulfs Stelle wäre ich jetzt etwas beleidigt. Nur mal so zum drüber nachdenken.